Combined pressures on the Amazon are pushing it towards a tipping point, which may be much closer than scientists previously thought. Can a new economic paradigm emerge to prevent it? Hiking through dense rainforest from the field station, I arrived at the foot of flux tower ZF2 K34. My guide encouraged me to grab the ladder running up the inside of the steel scaffolding and I clambered towards the canopy 55 m above. Occasionally, my grip slipped and I stopped to wipe my sweating hands on my jeans – there were no harnesses or helmets. One leg shook slightly. I wondered if I would be able to control it. Eventually I broke free from the canopy, hugged the ladder with all my strength, and gazed at the vast ocean of trees. The tower swayed in the breeze. Above me, ZF2 K34’s instruments whirred, measuring the wind speed, carbon dioxide, humidity, and air temperature, but I was content just clinging on, breathing, taking in the view and bobbing on an endless ocean of trees. Not many people get this bird’s eye view of the Amazon, and even from the top of an observation tower, the scale is almost impossible to take in. Its area, somewhere between 5.5 and 6.7 million square kilometres (2.1 and 2.6 million square miles), depending on who you ask, is about twice the size of India. It holds over 10% of the world’s known biodiversity, produces more than 20% of the world’s oxygen, delivers 15% of the freshwater that flows into to the planet’s ocean, and stores an estimated 135–180 billion tonnes of carbon in its trees and soils.1 1. Nobre, C. A., Sampaio, G., Borma, L. S., Castilla-Rubio, J. C., Silva, J. S., Cardoso, M., 2016. "Land-use and climate change risks in the Amazon and the need of a novel sustainable development paradigm." Proc. Natl. Acad. Sci. 113(39):10759–10768. DOI: 10.1073/pnas.1605516113 See all references This is an engine of the Earth’s biosphere, the layer of life that envelops the planet. 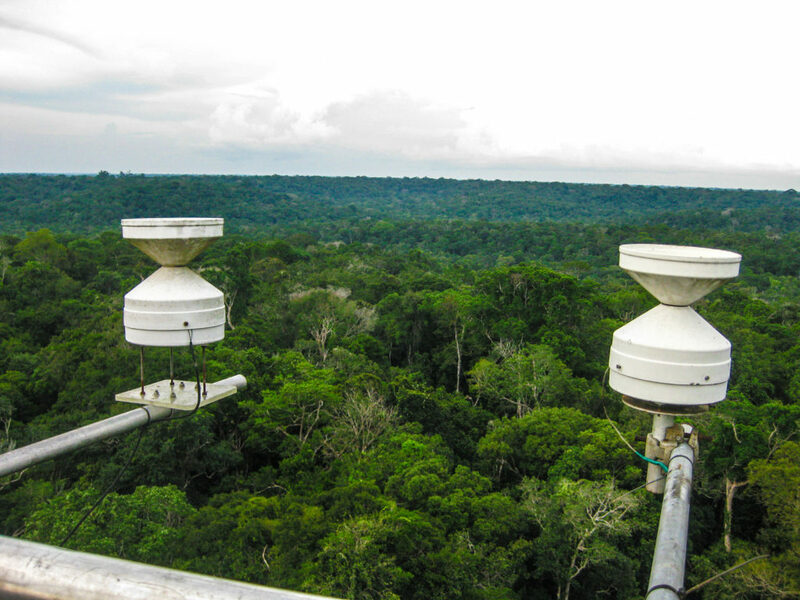 Above the rainforest, sensors perched atop a 55-m-tall observation tower track air temperature, humidity, and more. Copyright: Wendy Broadgate. Gingerly, I climbed down through the canopy to the forest floor. This area, at least, is still part of the intact forest, though the Brazilian city of Manaus, just a few hours away in a 4×4, is expanding rapidly. A few decades ago the Amazon was viewed as an infinite resource. But exponential growth in farmland, roads, and population – due to a rapacious global appetite for meat, soya, and a few other commodities – is pushing up against its boundaries. Among the researchers exploring the complex ecosystem and its impact on the rest of the Earth, some are teasing apart the tangled web of multinational companies, investments, and policies that fuel the disruption of these global commons. Together, a new picture of the rainforest is emerging. The flux tower is part of the remarkable Large Scale Biosphere-Atmosphere Experiment in Amazonia, known as LBA, an international project to understand the Amazon and its role in the Earth system. My host on this visit, Brazilian researcher Carlos Nobre, has been involved since its inception in the early 1990s. At the time, Nobre and his colleagues began looking at the stability of the Amazon and asked, what would it take for the rainforest to transform to savanna, and what would that imply for biodiversity and climate. They proposed the “savannization hypothesis” and have been fine-tuning it ever since.2 2. Hutyra, L. R., Munger, J. W., Nobre, C. A., Saleska, S. R., Vieira, S. A., Wofsky, S. C., 2005. "Climatic variability and vegetation vulnerability in Amazônia," Geophys. Res. Lett., 32, L24712. DOI: 10.1029/2005GL024981 See all references The hypothesis speculates that deforestation will change the climate in the southern and eastern Amazonia, creating a longer dry season, a warmer climate, and less rainfall. But when Nobre talks about “savannization”, don’t expect roaming antelopes or lions. But do think less water: the rains will diminish and the dry seasons will get longer. In the past decade, we’ve caught glimpses of what could happen: the region has been hit by record-breaking droughts (2005, 2010, 2016) and floods (2009, 2012, 2014). Nobre says that the flooding taking place now is worse than in 2014. The droughts in 2005 and 2010 led to carbon dioxide releases of over 5 billion tonnes each – that’s about equal to US annual fossil fuel emissions. Patrick Keys, a researcher at Colorado State University, Fort Collins, explored the links between deforestation and climate as a graduate student at the Stockholm Resilience Centre (SRC). “There are several big impacts to the Earth system from changes in the Amazon. First and foremost is carbon,” he says. 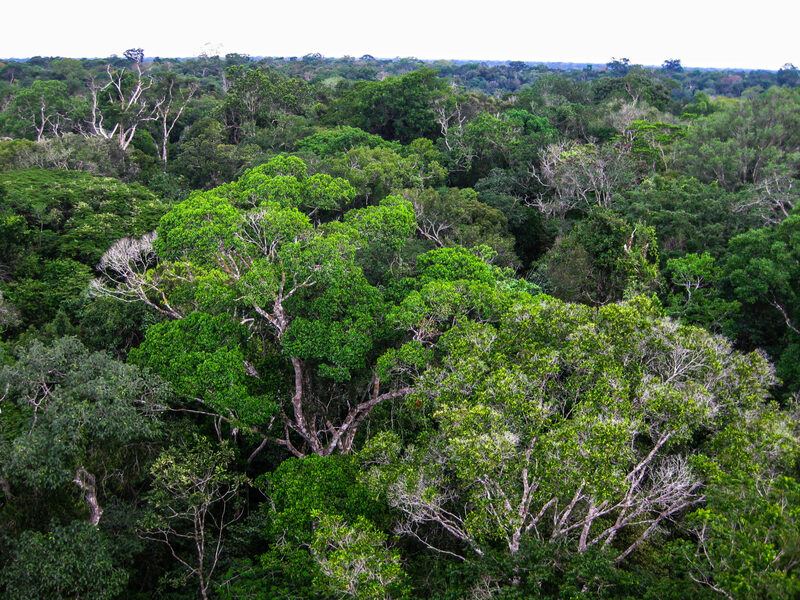 The Amazon pulls carbon out of the atmosphere and stores it in soils and trunks. “If the Amazon were to become a source of carbon via large-scale fire or deforestation and subsequent decomposition, then it could begin releasing very large volumes of carbon, accelerating climate change,” Keys says. This would leave the Paris Agreement, to keep global average temperature below 2°C, in tatters. Pressures on the Amazon from human activities have increased over the past century or more, illustrated by the upward-sloping curves of the “Great Acceleration” in population, land use, and other factors. Image: Elsa Wikander/Azote. Recently, I met Nobre again when he visited Stockholm to collect the Volvo Environment Prize for his work on the rainforest. Over coffee at the Royal Swedish Academy of Sciences, he spoke about his deep emotional connection to the forest. This has been his life’s work. With colleagues, he concluded that if regional temperatures rise 4°C above pre-industrial levels or if deforestation reaches 40% of the Amazon, then the rainforest is at grave risk of destabilisation, leading to what he calls “savannization” in the south and east.1 1. Nobre, C. A., Sampaio, G., Borma, L. S., Castilla-Rubio, J. C., Silva, J. S., Cardoso, M., 2016. "Land-use and climate change risks in the Amazon and the need of a novel sustainable development paradigm." Proc. Natl. Acad. Sci. 113(39):10759–10768. DOI: 10.1073/pnas.1605516113 See all references The 4°C tipping point in the region could be reached early in the second half of this century – if greenhouse gas emissions do not fall to zero by around 2050. About 20% of the forest has gone already. Building on previous work, Nobre and colleagues recently calculated the combined effect of global warming, deforestation, increased forest fire, and the so-called carbon dioxide (CO2) “fertilisation” effect, which may make ecosystems more resilient to climate change. Putting all these effects together, their work provided substantial support for Lovejoy’s estimate. They concluded that more than 50% of the Amazon forest could disappear with only a moderate degree of global warming (global average temperature of around 2-3°C warmer than pre-industrial temperatures) and 20% deforestation. This would outweigh any positive impact of elevated atmospheric CO2. The politics of Amazonian deforestation are tangled and contradictory. “In the early 1970s, the Brazilian military government started the occupation of the Amazon, creating incentives for hundreds of thousands of migrants to move in, subsidising large cattle ranches, and road building,” Nobre explains. The policy was to develop the economy through rapid exploitation of natural resources. But it has failed: “Agricultural output per unit area in the Amazon is only one-quarter of more productive areas in Brazil,” he says. 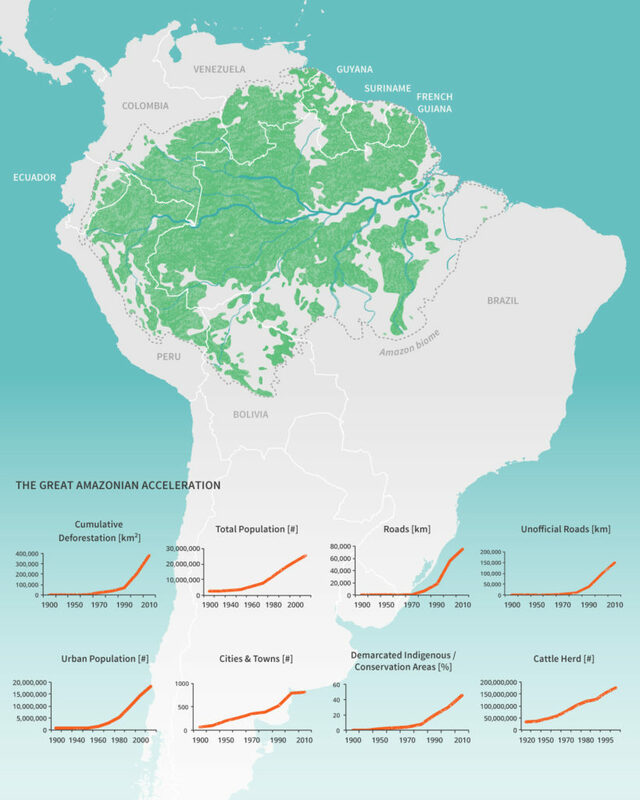 In 2004, Brazil pushed through new policies instead and created more protected areas. It also invested in almost real-time monitoring using satellites and other technologies to stem the loss of forest – spearheaded by Nobre’s institute, the Brazilian National Institute for Space Research (Instituto Nacional de Pesquisas Espaciais; INPE), just outside São Paulo. 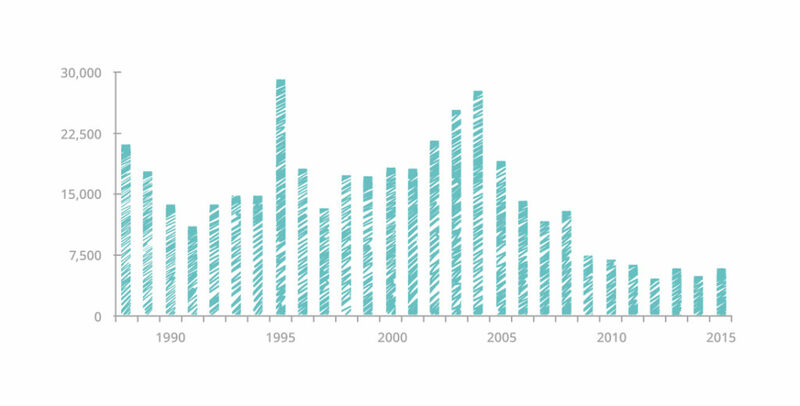 Since then, deforestation rates have fallen by an impressive 80% in Brazil, but there’s been less progress and fewer policy incentives in other countries, for example, in Bolivia. Brazil’s trend is also stalling. Researchers from INPE recently reported that farmers and loggers had cleared 8,000 square kilometres (over 3,000 square miles) of the Brazilian Amazon forest between August 2015 and July 2016 – a whopping 29% increase from the previous year, though still a 71% reduction compared with 2004. The amount of square kilometres lost every year to deforestation in the Brazilian Amazon fluctuated from 1988 to 2015, according to satellite data analysed by Brazil’s space agency INPE (http://www.obt.inpe.br/prodes/prodes_1988_2016n.htm). Estimates from last year continue a slowly increasing trend, after a peak in 2004. Image: Elsa Wikander/Azote. To halt deforestation, and even to think about regrowth, we need a better understanding of the drivers. Like that other driver of change in the Amazon – global fossil fuel emissions – the causes and solutions to deforestation lie beyond Brazil’s borders. “Beef production in Brazil is the key driver of deforestation, especially until the mid-2000s,” Persson said, while at an event in Stockholm for the Volvo Environment Prize with Nobre. “It is estimated to account for roughly 80% of deforestation in the Amazon.” Persson and his colleagues’ work indicates that the amount of deforestation linked to exports doubled between 2000 and 2011. “The drivers of deforestation have become more global and commercial,” he said. Meanwhile, large multinational corporations have shown a growing awareness that they bear some responsibility for deforestation around the world. Unilever and Procter & Gamble are two giants that have pledged “net-zero” deforestation in their supply chains. But global supply chains are complex and often opaque. Several new online visualization tools aim to create more transparency. The World Resources Institute’s Global Forest Watch shows real-time deforestation monitoring. And a partnership between the Stockholm Environment Institute and the Global Canopy Programme created the new Trase.earth visualisation and analytic tool; Trase can explore supply chains related to Amazon deforestation down to a remarkable granularity of Amazonian regions through to exporting and importing companies to final destination countries. Launched at the tail end of 2016, the site has data only for soya and beef at the moment, but it will eventually include palm oil and coffee. Just as producers, consumers, policymakers, and scientists begin to get a handle on the levers of change, along comes the next challenge. As Persson explains, while consumer awareness in Europe and North America may be growing, leading to demand for forest-friendly soya and beef, producers are now looking to rapidly expanding markets in China, for example, where consumer awareness is much lower. Indeed, these growing markets could reverse whatever progress has been made. 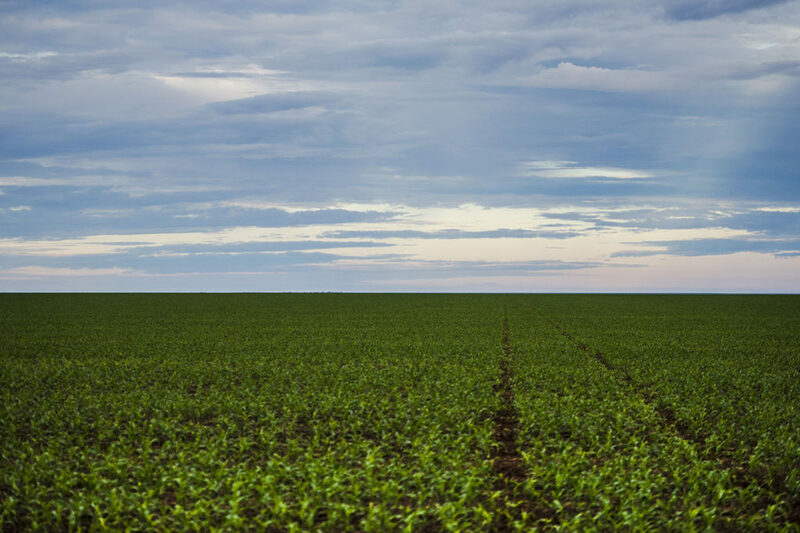 A soya plantation near Brasnorte, northeast of Mato Grosso, Brazil, is one of many large-scale operations in an area once half-covered in rainforest. Photo: Marcelo Camargo/Agência Brasil [CC BY 3.0], via Wikimedia Commons (https://commons.wikimedia.org/wiki/File%3ASojaBrasnorte.jpg). During his Volvo Environment Prize lecture last autumn, Nobre discussed a new approach to Amazon economic development. Usually, he argued, the choice presented is between economic development and conservation. While Brazil has developed rapidly in the past few decades, the economic contribution from Amazon deforestation has been weak and inefficient. On the other hand, 43% (2.1 million square kilometres, or 810,000 square miles) of the Amazon is legally protected from economic activity. Perhaps there is a third way consistent with zero deforestation, which is necessary for climate stabilisation, yet delivers more effective economic development. The Amazon is a biodiversity hotspot, Brazil is a rapidly expanding economy, and Nobre believes that the two can go hand in hand. He likes to say that the world is at the start of the Fourth Industrial Revolution, driven by digital, nano-scale, and biotechnology breakthroughs. He argues that the rainforest could be a unique contributor to this revolution. The world needs new energy technologies, new carbon-storage innovations, new medicines, and new ways to clean up pollution. Learning from nature offers potential solutions – for example, biomimicry and figuring out how to photosynthesise without plants. For Nobre, that means building on not just the data gathered from tower ZF2 K34 and the network, but “reading” the library of information preserved in the entire forest. That archive of biodiversity, its airborne atmospheric rivers and sequestered carbon, and more could eventually provide the answer to the question of how to preserve the forest itself. Resilience thinking: from marshes to Madonna.